This coming July marks the 50th anniversary of the first manned mission to the moon. The historic Apollo lunar landing on July 20, 1969 came to symbolize boundless curiosity and the desire to explore the unknown reaches of our universe. Progress in space exploration has since followed by leaps and bounds and sparked the public’s imagination of humankind’s next stop beyond Earth. Perhaps colonies on the moon or Mars? Or finding life elsewhere in our solar system? Meanwhile, the collective financial investment and social engagement in learning about our own planet—particularly the depths of the global ocean—surprisingly pales in comparison. Despite thousands of years of ocean exploration, vast areas of the seafloor have not been mapped in detail, and we still continue to discover new life forms and oceanic phenomena at every turn. If you have an interest in pursuing a career in the ocean sciences, be assured that there are many mysteries waiting to be solved, new life forms that have not yet been described, and places no person has ever seen before; the age of exploration here on our own planet is far from over. Those thoughts were a key source of inspiration behind this year’s annual report cover. The animals shown are but a tiny subset of the hundreds of new species that MBARI researchers have discovered within the past thirty years, and most of those creatures were found in our backyard—Monterey Bay and its adjacent waters, literally an infinitesimal slice of the global ocean. Some of those species are so bizarre that they defy imagination and could easily be mistaken for aliens from another realm. 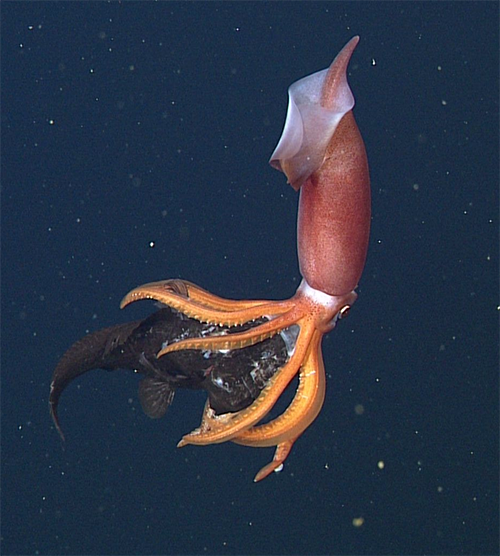 One of the interesting animal behaviors discovered in Monterey Bay, a small black-eyed squid eating its much larger prey, the owlfish *Bathylagus milleri*. This squid is about 10 centimeters (four inches) long, while the owlfish is about 25 centimeters (10 inches) long. Over the same time, we have also found animal behaviors and interactions that were previously unknown, brought undersea geological features and ancient seafloor communities to light for the first time, uncovered unique chemical and biological processes, and revealed deep-sea volcanic eruptions and massive sediment transport events that have been extremely difficult to document until recently. These landmark discoveries and advancements, all within the span of MBARI’s short history, were made possible by fostering partnerships between scientists and engineers, coupled with technology developments, that greatly improved our ability to access and visualize the ocean’s interior—precisely what David Packard, MBARI’s founder, envisioned. One can only imagine what new discoveries await in the years ahead. This why we at MBARI have come to refer to Monterey Bay as being a window to the world. Its unique location adjacent to a deep submarine canyon makes it a perfect for developing new systems for studying ocean waters and the underlying seafloor, leading to opportunities for making novel discoveries both locally and far afield. The concentration of institutions surrounding Monterey Bay that touch on some aspect of ocean education, science, engineering, policy, resource management, or conservation naturally brings together experts from many different walks of life and catalyzes interdisciplinary collaboration. 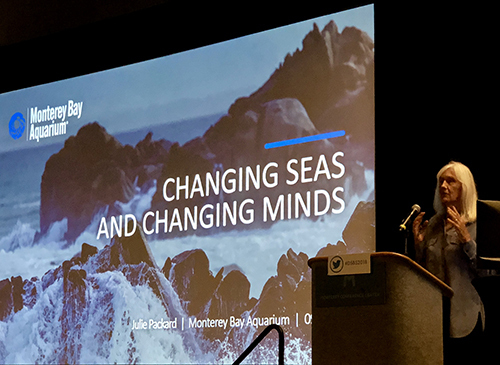 Julie Packard, the executive director of the Monterey Bay Aquarium and chair of MBARI’s board of directors, gives a plenary talk at the Deep-Sea Biology Symposium. Photo by Susan von Thun. This confluence of place and people served as an apt backdrop for the 15th Deep-Sea Biology Symposium held in Monterey, California, last September which MBARI and the Monterey Bay Aquarium co-hosted. The meeting brought together researchers from over 30 countries, providing a forum for leaders from various fields in the deep-sea science community to share findings of their latest research. Among the plenary speakers was Julie Packard, chair of the MBARI Board of Directors and executive director of the Monterey Bay Aquarium. Packard highlighted the benefits of using technology to further ocean exploration and education, and the importance of inspiring people to care for and properly manage the precious resources the sea provides. Ironically, as Packard pointed out, as we accelerate our understanding of the ocean’s vital role in sustaining life on Earth, we do so at a time when it is increasingly under threat due to human activities that impact even the most remote and distant corners of our planet—including the deep sea. All of us are inextricably connected to the ocean in some way, regardless of how close or far we may live from the shore. This was the sentiment behind a New York Times article published last June that Julie Packard and I had the good fortune to co-author. Challenges stemming from pollution, overfishing, climate change, and deep-sea mining all point to the urgent need to learn about the ocean’s myriad of species, its function, and ultimately its health. A cooperative, ocean-wide monitoring network is needed to track and report threats to inform sound climate policy, and to promote sustainable management practices. Given the unprecedented global changes taking place before our eyes, now, more than ever, we need enthusiastic and inquisitive minds to turn their ambitions towards our global ocean—our very lives may one day depend on it. As MBARI embarks on its fourth decade of furthering ocean science and technology, what we call “MBARI 4.0”, we face both the excitement of the unanticipated discoveries that lie ahead as well as the realization that the very animals and processes we seek to learn about are undergoing profound changes and may be irrevocably altered before we can even describe them for the first time. Arguably, never before has there been such a moment in the history of ocean science. Bringing this information to light for a broad audience, inclusive of scientists, engineers, policy makers, and the public at large, is one of MBARI’s primary goals, and was a driving force behind Heidi Cullen’s arrival at MBARI this past year. Among many other duties, Cullen now oversees communication of an eclectic mix of topics that span from the sea surface to seafloor, encompassing all disciplines of ocean science and technology, even marine archeology. Disseminating results of our work via interactive digital and social media, traditional print and video outlets, and live presentations, are all aimed at sharing the wonder of what lies beneath the ocean surface as well as highlighting the importance and societal benefits that fundamental marine research and engineering affords. As part of our new outreach strategy, we are working more closely with the Monterey Bay Aquarium (MBA) to take on collaborative projects that benefit from the different perspectives and expertise that each of our organizations provides. This year’s articles on the White Shark Café and environmental DNA (eDNA) with the Environmental Sample Processor are but two examples of such joint “MBA/RI” initiatives, each of which includes elements of basic science, engineering, and technology development to meet needs associated with resource management and conservation issues. Other engagements that we report on this year in conjunction with academic, nonprofit, and commercial entities, as well as government agencies, similarly showcase the power and potential of what cooperation and partnership can do to spur fundamental science and engineering advancements while simultaneously achieving outcomes for the public good. While space exploration understandably holds wide appeal, you may be surprised that a look inward into our ocean also offers a parallel frontier replete with technological challenges, mysteries, and wonders. The sea offers us much to discover, to benefit from, and manage wisely, and, if we are not careful, much to lose before we even know what may be lost. As I look ahead, there is no doubt that 2019 will prove to be another year of exciting marine science and technology advancements. Please follow us as we continue our journey of ocean exploration and discovery by visiting our website, as well as by subscribing to our Facebook, Twitter, YouTube, and Instagram feeds. Keep in touch—we look forward to hearing from you! MBARI's ongoing investment in ROVs and access to the sea has led to advances in the understanding of the animals and communities in the ocean's midwater.